As the New China News Agency, Xinhua, takes over a 60 foot by 40 foot billboard in Times Square in New York, the same could be said for that media outlet. Xinhua is news. It has been the media mouthpiece of the world’s largest nation for over six decades, and it should be looked at in objective detail. This is more than just China-watcher or media maven esoterica. As we move into the fifth generation of Party leadership in the coming 24 months, we will be taking a further step away from the rule-by-individual that characterized the first four post-revolutionary decades. We are well into an era where China’s single-party state is run by the construction of a consensus on an issue-by-issue basis. Where once sat rubber-stamp toadies now sit leaders whose support is required for every significant initiative and action taken by the central government. The consensus-building usually takes place behind closed doors, but when a particularly contentious issue arises, or when a relatively small group is trying to champion an initiative and is having a hard time building support, the process bursts out of those rooms and into certain government media in the form of an isolated quote in an innocuous article, in an editorial, or in an analysis piece. The challenge for those of us trying to navigate our way through China’s political fog is deciding whether one of these journalistic tidbits means we should sit up and take notice, or whether it is so much positioning. To understand this, we have to understand how Xinhua’s role is changing. Is Xinhua a government mouthpiece to the extent that its positions reflect those of the Party? Is it more independent, and thus free to post articles like this without regard to policy? Or is it somewhere in the middle: that Xinhua is a tool used at will by various Party leaders to incite or test wider support for a possible policy change? While it was once the former, I suspect that it is becoming a combination of both the former and the latter. And for that reason Xinhua demands study. We have to understand when Xinhua is floating a trial balloon on behalf of, say, a vice-minister of Finance, or when it is presaging a critical policy change. Regardless of your vocation, if China touches you or your work, that is an essential distinction. 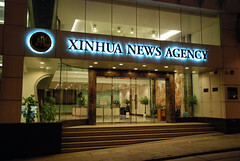 So rather than continue to dismiss Xinhua as a hand-in-glove extension of the Party (which I have to confess I have long done myself), we need to recognize that it is becoming one of the most important media companies on the planet, offering more than just prepackaged propaganda for the Chinese masses, but actionable insight into the Chinese polity and society. The microscope that media watchers once turned to The New York Times, The Washington Post, Time-Warner, Disney and News Corporation must now be focused on the most enigmatic specimen of all. This entry was posted in Media Hutong, Policy & Governance. Bookmark the permalink. As Xinhua develops and matures, it will gain some degree of professional independence, some corporate spirit and methodology, so I don’t see it as merely a mouthpiece any more. I’m reminded of JK Galbraith’s notion of the technostructure, where a corporation develops and seeks to become self-perpetuating – Xinhua is obviously used to reflect policy and ideology but will be able to influence that, too. It obviously merits close analysis – more than ever! I haven’t studied in detail how the Chinese and English content published by Xinhua differ, but I feel the content for overseas readers may not be the best window into Party politics. It’s going to be filtered more heavily to ensure the country is presented in the best light, rightt? Dai, that’s what we assume, but the point is that we don’t know. The English language coverage is certainly aimed at a different audience, but WHY it runs what it does and takes the positions that it does are no longer purely about external propaganda. It is time we understood why. The other point I should have made in the piece is this: if the relationship between Xinhua and the Party is evolving, or the purposes for which the Party uses Xinhua are evolving, that alone is worth knowing. But simply tossing Xinhua in a pile alongside ITAR-TASS and the Goebbles machine, which most of us do as a reflex, is a mistake. Xinhua – and all of the evolving media conglomerates in China – need to be understood better because they are evolving, the media environment in China is evolving, and because these outlets will play such an important role in China’s effort to get its story out around the world. Arent there enough places online that offer the type of info you mentioned more directly? The net is a dynamic force in the transparentalization of chinese politics. In this light, xinhua is pretty unhelpfully old school. China watchers of a half century ago might have used the approach youre recommending. . . But cant we do better? Vasic, you make a fair point, one of which I was convinced for a long time. Recently, however, I’ve noticed Xinhua starting to cover off on issues of policy that other media and sources were not discussing, the most relevant being the VIE issue, so I posit that it is time to put them up on the radar. Even when other sources do discuss an issue, Xinhua’s take is worth consideration by virtue of its role as a party mouthpiece. I have found watching Xinhua more valuable than the People’s Daily, CCTV, Guangming Daily, and BYD for that reason. At the very least, Xinhua merits inclusion in a list of sources for a China watcher.